Aug. 13, 2009, 3:22 p.m.
By Zachary M. Seward @zseward Aug. 13, 2009, 3:22 p.m. So what about THE BEACON? I immediately flagged “IP address of the content viewer.” In recent years, the recording industry has used the IP addresses of downloaders to pursue legal action against people sharing music online, leading to lots of ill will toward the RIAA. That said, recording such data isn’t all that unusual. Websites using basic analytics software already record the IP addresses of their users. By “intentionally or inadvertently remove the beacon,” doesn’t the AP simply mean copy and paste the text of an article? While there’s been some innovation in the field lately, it’s difficult to imagine how the beacon could survive the magic of Ctrl+C, and that’s an obvious limitation of the tracking system. But referring to that as removing the beacon called to mind the anti-circumvention portions of the Digital Millennium Copyright Act, which criminalize attempts to get around copyright controls like burning an encrypted DVD. Now, I can’t imagine the AP would have a legitimate claim there, but I gave it a go with Kasi, who said, “You may be giving it a lot more heavy reading than” intended. I told Kasi that there seemed to be a persistent disconnect between the AP’s rhetoric on copyright and what it actually cares about. He acknowledged that the consortium had not always effectively communicated its intent: “It’s easy to think that, when you read ‘beacon’ and given the issues of some other companies and so on, you can immediately jump to the conclusion, ‘oh, this is a persistent cookie that’s going to track this user across all kinds of sites.’ No.” That was surely a reference to Facebook’s poorly received advertising platform, also known as Beacon. 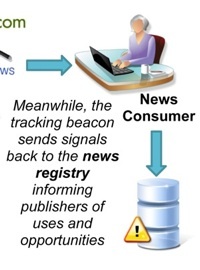 The AP’s graphic explaining the beacon and a new microformat was easily mocked and labeled “magic beans” by prominent tech blogger John Gruber. In the clip from the actual graphic at right, doesn’t it look like a faceless news consumer will be deposited in a toxic waste receptacle? But in talking to Kasi, I came away with the same impressions as Columbia Journalism Review’s Ryan Chittum: that the AP isn’t interested in broadly pursuing copyright claims against republication of its content. In fact, they’re hoping to encourage distribution in certain ways, and there’s plenty of innovative stuff in the microformats they’re adopting. The AP just needs to clear up what kind of “rampant unauthorized use of AP content” — that’s from the document — they want to combat. And that’s the topic of my next post. This is the third in a series of posts on the AP’s online strategy. 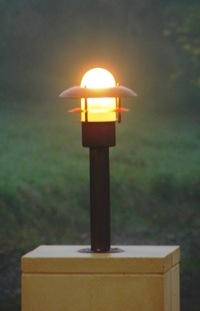 Photo of beacon, by Brenda Anderson, used under a Creative Commons license. POSTED Aug. 13, 2009, 3:22 p.m.
Seward, Zachary M.. "What The Associated Press’ tracking beacon is — and what it isn’t." Nieman Journalism Lab. Nieman Foundation for Journalism at Harvard, 13 Aug. 2009. Web. 23 Apr. 2019. Seward, Zachary M.. "What The Associated Press’ tracking beacon is — and what it isn’t." Nieman Journalism Lab. Last modified August 13, 2009. Accessed April 23, 2019. https://www.niemanlab.org/2009/08/what-the-associated-press-tracking-beacon-is-and-what-it-isnt/.